Join the discussion on our forums! Come discuss Bloodreaver Gul'dan over in our dedicated Bloodreaver Gul'dan discussion topic. It's still beyond stupid how this card has not gotten any nerfs for 2 years straight. It's one of the best, if not the best card in the entire game. Freakin 65% after play winrate. That's about the highest of all cards that are not part of some elaborate setup or OTK. I'm going to miss this card so much in next year. Still the most overpowered card in Hearthstone, without question. 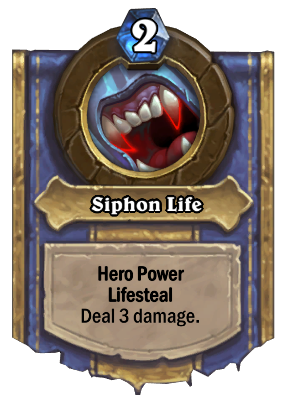 Obviously the battlecry is extremely strong and I would say superior to N'zoth, but for now just look at the fact that it changes your hero power to: "3 damage to ANY target with lifesteal". 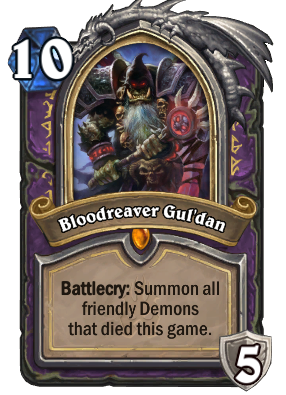 If there were a card that cost 2 mana and had this ability (Darkbomb with lifesteal), essentially every deck of every class would include it... With Bloodreaver Gul'dan, you effectively get this overpowered card every turn in the late game, and you still get to draw a card each turn. None of the other death knight hero abilities would be auto-include if they were stand-alone cards (Jaina being the closest I would say). Now think again about how it also has the strongest battlecry out of all the death knight cards. Who took forever? Why? Because Warlock is the second to last hero I play. I use my dust to craft cards I will use the most, not the least. Simple logic my friend. This might be fair if it set the Warlock's health to 15 and didn't give armor, like Jarraxus. Or if it was "Discover a friendly demon that died this game, then re-summon it." Winning with a one card power play is really cancerous for the game. This is straight up broken, just look at his hero power! I'm fairly new to this game, as I only started playing a few months ago. But I'm heavily into card and board games, even designing a few myself in the past. So I feel I have a decent knowledge of when a certain card is unbalanced. And boy, are my spider senses tingling when I see this card. There are a few clearly broken cards in the game but this is by far the worst offender I've come across. Summoning up to seven demons at once is incredibly game changing. Especially since you get to ignore their usually harmful Battlecrys. 5 armor might save you as your opponent desperately tries to win before you take another turn. These two features make the card powerful enough. But the hero power, god, is it stupid. For the same regular cost of 2 mana, you get a 6 health swing each and every turn. Nothing else in the game compares. I think its almost always game over when this card is played. I believe this card has been out for awhile. It seems most agree with my analysis. It saddens me that the designers have not taken steps to fix this. Balancing is an important part of any game like this. Get on it please Blizzard. And imagine me when I got it in my first KoTF pack, for FREE!!!! As strong as this card is, I highly doubt Blizzard will nerf it anytime soon. As of the nerf patch, Warlock is performing just about average in comparison to other classes, and for that reason, I don't think Blizzard plans to nerf this card in the near future. Let's be grateful we currently we have a pretty diverse meta, with many different decks being viable. Keep in mind though that there are other cards in the game that are also extremely powerful, a Druid ramping into a turn 6 ultimate infestation, or even fellow death knight Frost Lich Jaina are arguably just as game changing, given that they can be played earlier in the game. I agree that this is an extremely powerful card that Blizzard should consider changing in the future, but in the current moment, I don't see it happening as Warlock as a class currently isn't overperforming like it used to be. this should summon 1 of each demons.